Turn your 18-Inch doll into a mermaid fashionista with our smaller version of the Lotus Moon mermaid tail design! Tail set includes both tail and top in swimmable fabric. Doll not included. 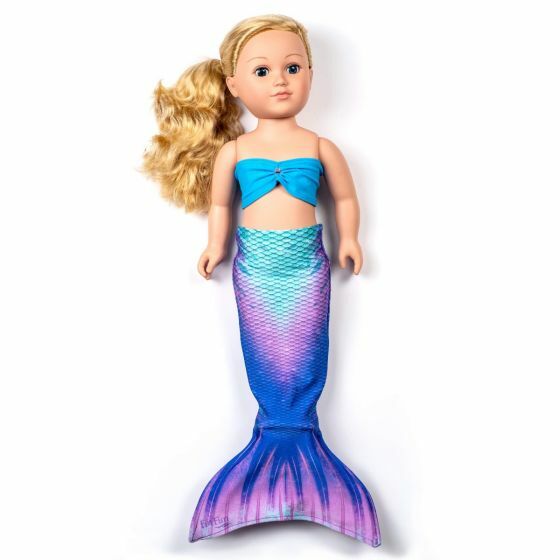 Dress your doll in the latest mermaid fashions with a doll tail set from Fin Fun! This Limited Edition design features the same pattern as our full-size version, but on a smaller scale so kids can match their favorite doll or just dress them up for adventure! This mermaid tail set for 18-inch dolls includes a mermaid tail and top made of stretchy swimsuit material, which makes dressing dolls for playtime so easy!